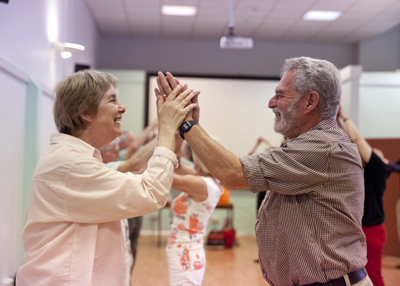 High quality dance classes for people with Parkinson's, their family, friends and carers. Due to the on-going success and demand for the programme, English National Ballet and Oxford City Council are delighted to be in a position to continue running the Dance for Parkinson’s programme in Oxford. Dance for Parkinson's is a national programme of high-quality dance activities for people with Parkinson's, their carers, their family members and their friends. Weekly dance classes provide a creative and artistic opportunity for participants within a supportive and social environment. The classes also provide an additional positive benefit to physical and mental health and wellbeing. The results of the award-winning "English National Ballet, Dance for Parkinson's, an investigative study", carried out by Dr. Sara Houston and Ashley McGill of Roehampton University can be found on the e English National Ballet website or Roehampton Dance website. As usual, participants can pay in advance or weekly. Classes are £5 per person including carers, friends and family. Next term the fee will be £50 per person for the full ten weeks. Due to the demand on the programme, we are currently holding a Waiting list for new participants. During the Spring 2019 term we will review how many new places we can open up to the waiting list. If you would like your name to be added to the waiting list, or if you have any queries about the programme, please contact Claire Thompson on [email protected] / 01865 252820. "To forget I have Parkinson's for a couple of hours a week has been a most positive experience." "Please accept my thanks for a truly enjoyable, as well as beneficial twelve week series of ballet classes. All of us found some measure of healing in the movement and music, enthusiasm and camaraderie. Some were literally transformed between the beginning and the end of a class, and we would like to be able to continue with our weekly exercises and music, imagining and laughing (or crying)."